The recipe for the blueberry popsicles will be posted tomorrow on my husband's blog: MadeForJen. They are delicious. Both my assistant & I had some today... well I had 2!!! Also, new bracelets at MadeByGirl !!! Enjoy your weekend!! These look amazing. A perfect Summer treat. That looks so refreshing! What a lucky gal to have a hubby who makes such yummy treats. :) Happy weekend! Looks yummy! 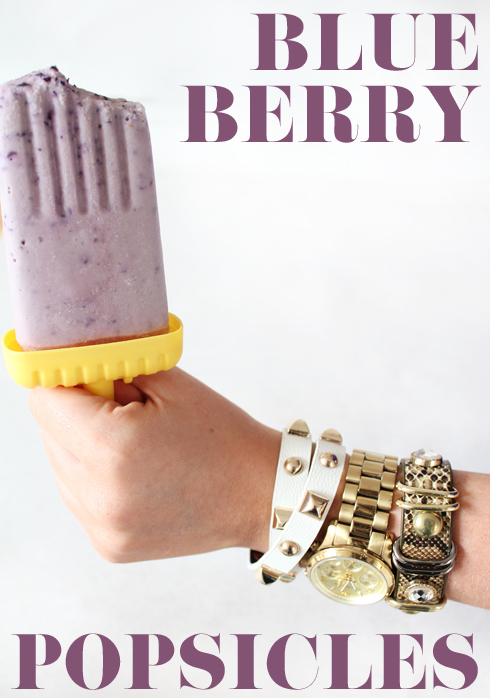 I love blueberries, but I've never thought to make blueberry popsicles. Will give it a whirl, maybe with some yogurt. Ok, just visited the recipe. You DO use yogurt. Haven't tried shave sweetener, but heading to the market this evening. I'll use almond milk in place of the soy. Looks so good. L: yes, with yogurt it tastes so much better, however today we tried making them with rice milk & although it was good, it didnt have the same milky texture as the with the soy milk. Aww the name of your husband's blog makes me so happy - that's true love! :) So cute. I just checked it out and the food looks amazing! I am so excited to start following. And those popsicles are so perfect for this heat wave that's happening across most of the country right now! owAww the name of your husband's blog makes me so happy - that's true love! :) So cute. I just checked it out and the food looks amazing! I am so excited to start following. And those popsicles are so perfect for this heat wave that's happening across most of the country right now!